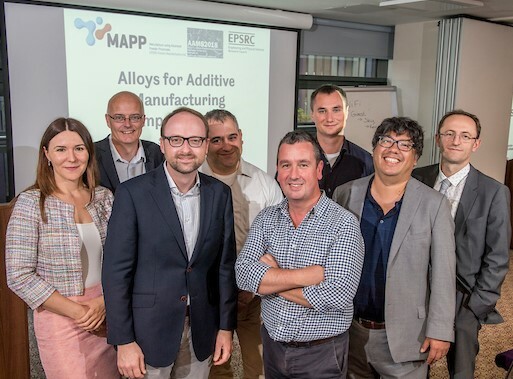 Every now and again I'm really reminded of how excited people are about Additive Manufacturing, and this was one of those times! I'd been invited to take part in a panel discussion about the future of Additive Manufacturing, organised by Kate Black and the Liverpool Women in Science and Engineering Society. Many of you will know Kate through her work in AM, and in particular in inkjet printing. The other AM-based panel members included Sophie Jones (General Manager of Added Scientific), and Rachel Park, who has been writing about AM for as long as I can remember (you may know her best for her work with Disruptive Magazine). Finally, we had Rebecca Davnall, a philosophy lecturer at the University of Liverpool. Personally speaking, I thought the inclusion of a philosopher added a really great dimension to the event when talking about the broader issues of AM, not to mention giving some real food for thought. Besides which, she gave us what was, in my opinion, the quote of the night - 'nature's really just about dirt and stuff killing stuff'! The whole thing was videoed and I've included the link, so I'm not going to go into detail about the discussion other than to say we covered topics as diverse as world hunger, personalised medication, eating insects, and Wolverine... If that's not enough to get your interest, I'm not sure what would be! Aside from the great company on the panel and the interesting discussions, what really made the event fun was the audience. I admit that when I said yes to the event I thought it would just be a nice chance to hang out and have a chat about something I'm passionate about, with the rest of the panel and a handful of interested audience members. As it turned out, the audience filled the space we had and seemed super engaged. I even spotted a few people taking notes throughout! Now I'm sure a large part of this is down to the organisation and publicity (everything was very well-structured and managed, so a big thank you to the organisers). But that many people turning out at 5.30 on a rainy afternoon to listen to a bunch of us chatting about AM still indicates a real desire to know more about this area. What I really took away from this was that we should be doing as much of this type of thing as possible, whether that be organising the event or simply saying 'yes' when asked to take part. For those of us lucky enough to be working in this area it seems we really do have the opportunity to inspire and engage with people outside of our own community, so I hope we see much more of this to come!